A year-over-year comparison of nearly two thousand multi-channel online merchants showed a drop in the number who accepted PayPal on their own websites and off-eBay stores. EcommerceBytes measured the number of merchants in the EveryPlaceISell.com directory who accepted PayPal on their off-eBay marketplaces in October 2010 and found that one year later, 22% of them had stopped accepting PayPal as a payment method on those venues. The study also found that the number of merchants who accepted credit cards on their own websites and off-eBay stores increased 19% in the same time period. EveryPlaceISell.com founder David Steiner said, "What we saw was that 22% of those merchants actively removed PayPal as a payment choice from their off-eBay stores, while nearly 20% more merchants began accepting credit cards. The cost of merchant credit card accounts has decreased substantially over the past several years, making it much more affordable for online retailers to offer it as a payment option." The study compared multi-channel merchants who had active listings on the EveryPlaceISell.com (EPIS) Merchant Directory in October 2010 with the same merchants' listings in October 2011. The study looked at all of the payment methods sellers accepted on their own webite and off-eBay stores. EveryPlaceISell.com is a free merchant directory launched in 2008 by the publisher of AuctionBytes and EcommerceBytes. The study looked at merchant adoption rates and did not measure customer usage rates. Credit cards showed the largest increase in adoption by EPIS merchants, jumping 19% in year-over-year comparison, followed by Money Orders at a distant second place at 7% higher adoption. 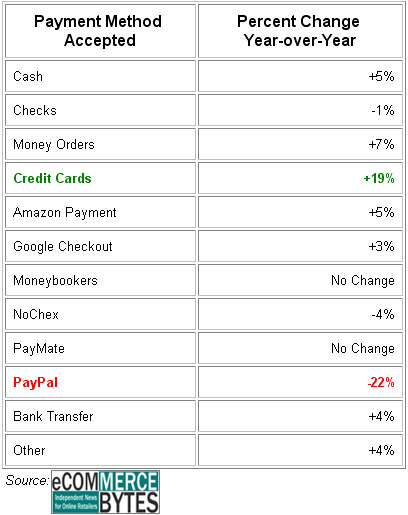 Amazon Payments and Cash rose 5% each, while Google Checkout increased 3%, and Bank Transfer increased 4%. "What is significant is that PayPal actually lost more share than any other payment method in this study, and that credit cards, one of the most likely challengers to PayPal's online dominance, showed the largest increase in adoption," said Steiner. The data is meaningful because of the real-world way in which it was collected, according to Steiner. "This is information that merchants are displaying for the benefit of online shoppers, making it more accurate than a survey or poll," he said.